Raise your hand if the highlight of your vacation is what you eat. If you are traveling to Cuba on your next vacation, the food won't let you down. The restaurants in Varadero are REALLY good and you'll find a ton of variety. 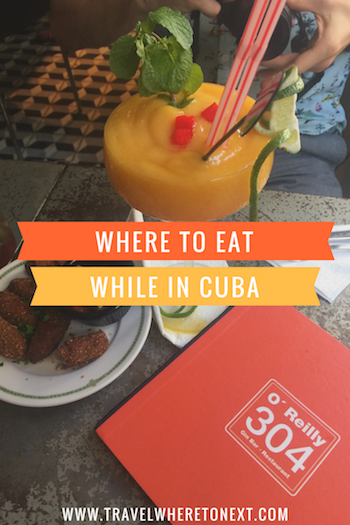 Below are all the restaurants I recommend you try during your next trip to Cuba. Although this was the most expensive dinner we had while in Varadero it was also the best. This is a private restaurant (i.e. not government run) and the 60 references it being on Calle 60 and also the 1960's advertisements used everywhere as decor. International as well as traditional Cuban is available. A live band plays as you dine. If you don’t make a reservation come early and drink some mojitos while you cross your fingers that a table becomes available. Small note: I use the term expensive in that it is expensive when compared to other restaurants in Cuba – I live in NYC, these prices at Varadero 60 would be considered affordable if this restaurant was in the states. Mains were between $10-18. One of the better government-run restaurants in Varadero. The portions are large and cheap and everything is flavored very well. Mains start at $4 and come with meat, rice, beans, salad, fried bananas and a coffee. Their house special, lobster with chicken and pork is an inexpensive $12.95. One of the biggest menus, with the most variety, in Varadero. The decor is gorgeous and service is on point. You'll find tapas, risotto, sushi, and even Cuban food here. Told you, it really has everything. Mains are pricey. A “chain” in Cuba - with locations in Mexico, Costa Rica and across Europe. It claims to be the birthplace of the mojito, but that is heavily disputed. Either way, the blue bar is covered top to bottom in sharpie signatures and has had some pretty famous clientele including Salvador Allende, the poet Pablo Neruda, the artist Josignacio and (supposedly) Ernest Hemingway. The original Bodeguita del Medio is in Havana, but the Varadero location was quite delicious. We even had live music during our meal. Mains were fairly priced about $8-11. La Barbacoa is the best steakhouse in Varadero. The decor is old world and the prices are super cheap since the restaurant is government-run. If you're looking for a state-run Italian restaurant that is still delicious you should definitely check out Dante. It lives up to the hype and is the best Italian restaurant in Varadero. Also, a super common question I get asked constantly is what camera do I use for my travels. The body is a Nikon D3300 and I mostly use this wide angle lens made by Sigma. It's awesome for travel photography - I am seriously obsessed with it.